If you have been wanting that 770, 790 or 880 Anniversary Gold now would be a great time to get it. The final gold machines rolled off the assembly lines this month, so getting your name in the hat now is key to actually securing one. 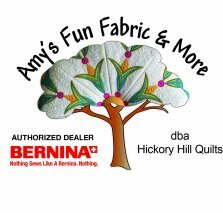 Now through the end of the year Bernina has all their machines marked at MAP on their web site as their holiday promotion. Hickory Hill will be matching that offer immediately even if I can't redo all my table tents at once! While you are in the door buying your machine, anything extra purchases that day will be 25% off! 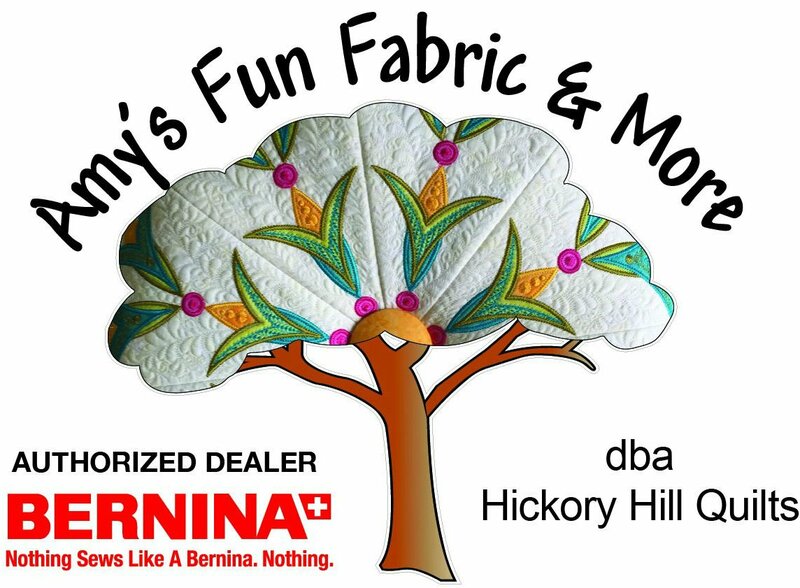 If your Bernina is having special problems, please e-mail your machine model and specific issue to info@hhqsewingcenter.com. We are bringing in a specialist on Wed and Thurs of next week (Oct 17 & 18) to help Skip get past the current back log of machines. We will try to assess and repair as many machines as we can in those two days. Parts will be an issue if you have boards out. He will not be doing clean/oil/adjust. Only repairs. We will let you know if we can put your machine in the line up. So if you have been thinking about it - again - now is the time for action. STAY TUNED TO THE WEB PAGE FOR THE REMAINDER OF THE YEAR. AS THE BEE'S AND EVENTS CHANGE, WE WILL BE FILLING THE ROOM WITH FUN CLASSES AND PROJECTS. EMBROIDERY CLASS is tomorrow and we will be doing damask pumpkins. They are adorable. It is kin to the free standing lace, but with fabric - no holes. We need more folks to sign up! Call in today. ROUCHED FLOWERS with Darlene Garsteki! (Art Project 4Q18 Funky Flowers is the name of the class.) Saturday, October 27 This class is hand work only and Darlene will kit one flower for each participant to include the beads and magnet to complete the project. The class is from 10:30 to 2:30 and costs $25. Michelle Jones has added some Beginner Free Motion with Ruler classes as well as without rulers! OPEN SEW DAYS W/ POT LUCK! October 30 and the theme is Gumbo! Amy will be making the gumbo herself - there will be no "strange" ingredients that might be seen in a traditional cajun gumbo. My mom was from Louisiana and it is good, but it is conservative. I already have a volunteer for rice, so we will need potato salad (you have to have potato salad with gumbo - Amy's daddy said so!) Garlic bread for dipping, desert or anything you want if you don't want to try the gumbo! Come sew with us. It is a fun day. The last Tuffet class of the year will be November 12 and 13. Ladies, please sign up. This is a two-day extended sewing class, but well worth the effort. If you have seen our samples in the store - you know the sky is the limit with what you can do with these. We love the new topper Barbara made for our batik dotted square tuffet. We have two signed up right now and will need three for the class to make. Barbara Wingo is the instructor. Once you sign up be sure you let Barbara know what kit you want to make. REMEMBER – THERE MUST BE 3 ATTENDEES FOR A CLASSES TO MAKE OR THE CLASS WILL BE CANCELED. Call the shop if you have questions or need help with sign up! 501-318-2739 The full year calendar is on the web! There is a little printer on the bottom right corner where you can print the month. WE NEED ALL BEES TO LET US KNOW THEIR SCHEDULE FOR THE REMAINDER OF THE YEAR. 10/31 – HALLOWEEN PARTY!!!! Come dressed in your Costume as a special treat for us and we will let treat you back!!!????!! !